Feathers fly at this fun, flash-mob type event which takes place annually on Valentine’s Day. It’s Pillow Fight. In the past, nearly 1,000 San Franciscans descended on Justin Herman Plaza with feather-stuffed pillows to run Braveheart-like at full speed at one another to lovingly beat the crap out of each other until their arms fall off. Please note, there’s nothing listed yet for 2019 on the pillowfightsf Facebook page, but that doesn’t mean that it’s not taking place. The event is always tentative – it’s like an unorganized flashmob. There could be 1,000 people; there could be zero people. The police could shut it down. Bring a mask or bandana to cover your mouth – it’s easy to choke on flying feathers. Bring a synthetic pillow (not one with feathers). Trust us… it’s much more enjoyable this way. Bring a garbage bag – have fun and then help clean up afterward. The price of having fun is keeping your city clean and makes it much less likely for the fuzz to shut this thing down. This is a great cardio workout. Build up your arm strength – your arms will be sore after this… trust us. It’s worth repeating… HELP CLEAN UP AFTERWARD. We can’t stress this enough, so that we can continue having fun anarchy like this. 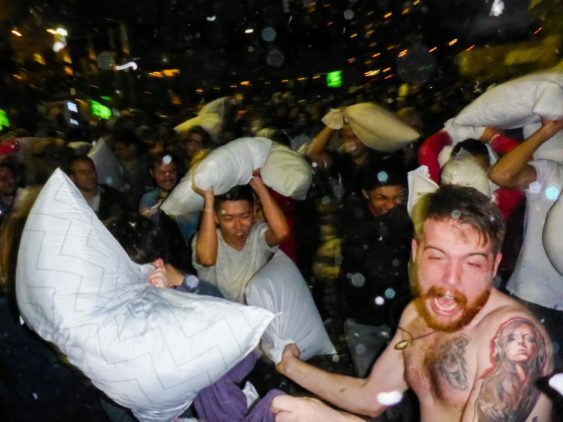 See some great photos of past Pillow Fights by Geng Giminski.